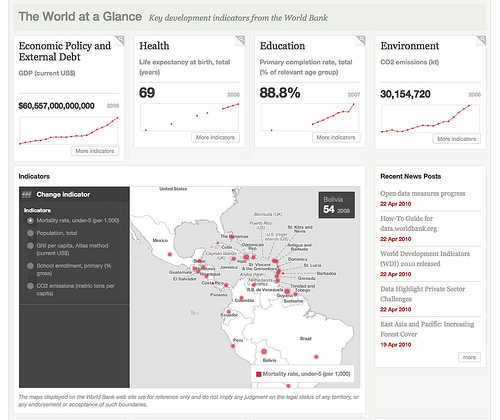 Earlier this month, the World Bank opened up its data and launched a new website – data.worldbank.org – where users will be able to browse and filter more than 2,000 financial, business, health, economic and human development indicators from World Bank data sources that had mostly been available only to paying subscribers. (Not at your computer? Find the info you need on the World Bank’s new Datafinder iPhone app.) The Open Data Initiative, as it’s called, was built by Development Seed, a Washington, D.C.-based strategic consultancy and open source product development company. Feedback has been positive: In the first week of its launch, the site attracted more than 132,000 unique visitors — a 224% increase in visitors compared to old Data site section. For the sustainable transport and urban planning world, these open data sets could prove highly valuable. A quick look at the “Urban Development” topic shows 14 different indicators, including things like the number of passenger cars per 1,000 people and transport sector gasoline fuel consumption per capita. World Bank Group President Robert B. Zoellick recently explained (see his video below) that it’s important to make data publicly available because, “Statistics tell the story of people in developing and emerging countries and can play an important part in helping to overcome poverty.” By the same token, they can play an important part in helping to overcome pollution, congestion, inaccessibility and other mobility-related concerns plaguing many of the world’s most iconic cities. The idea is that people will be able to reveal solutions to common urban problems by creating new tools, applications and “mash-ups” using World Bank data. Just two weeks ago, the World Bank announced the Apps for Development competition (sign up here for email updates), which is similar to innovation contests like Apps for Democracy, an invitation for developers to create Web-based solutions for D.C. residents based on publicly available local data (check out examples like D.C. Pedestrian, which shows the best walking routes based on things like level of safety and public transportation options; and DC Bikes, a guide to local bike routes, bike thefts and bike sales.) In New York City, the BigApps contest solicits entries for how to make the city more transparent, accessible and accountable (last year’s Grand Prize winner was WayFinder NYC, a mobile app that shows users the closest mass transit stations.) There’s a U.S. national project, too, called Code for America, which encourages designers and developers, as well as city governments, to think of ideas for how Web applications can improve civic life. These efforts are part of a larger trend to use data as a way to increase government accountability and transparency, as well as foster citizen collaboration and public participation, in cities around the world (see this example from the UK government; and another in Canada.) Now that the World Bank is going more global with its data, it’ll be interesting to see other countries – from Brazil to India – jump on the bandwagon and open their bandwidth.